Fairytales and Fitness: Why is this dog at the gym? So sorry for your loss. It is very hard to lose a pet, they are members of the family! I love that your gym lets you bring your dog. I am sure Baylee was so happy to be with you! I am so sorry for your loss :( It's such a hard time trying to get through it. 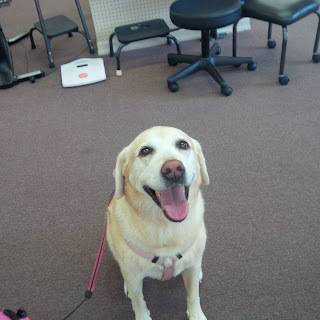 Baylee has been one of the best smiles ever, she always looks so happy. I am glad she is keeping you company at the gym! So sorry to hear about your loss. But I love that your gym allows you to bring Baylee there with you. She looks so well behaved in the pictures, and so happy to be by her mommy's side. My condolences! I've been there 6 times before with pets and it never gets easier, no matter how many times you say they aren't suffering anymore. Baylee looks so happy to be at the gym with you and I'm so happy all the seniors loved her. I'm so sorry to hear about your loss : ( Animals are so perceptive and smart. I'm sure Baylee is in mourning as well and probably finds great comfort in being with you. Oh no, I'm so sorry about your dog :( That is great that the gym allows dogs and Baylee sure does look happy to be there with you. I'm so sorry to hear about your dog! It's always so heartbreaking, but it's great that you're taking such good care of Baylee and she looks really happy to be with you! What a cutie. Oh, I'm so so sorry. My heart goes out yo you and Baylee and your family. I know she especially must be confused and sad about why her doggie brother is gone. It's great that you brought her to the gym so she could be near you, and she probably enjoyed all the attention. Hugs to you all! I am so sorry, my deepest sympathies go out to you guys. Losing an animal is so hard. I know your doggie was part of your family. Dogs grieve... I love you took your baby with you to let her know she's still loved even though her buddy is gone. I'm so sorry about that. I still got choked up about it. If I could take my dog with me everywhere, I totally would. My condolences to you on your loss. It's heartbreaking to lose a member of the family like that. BIG HUGS. 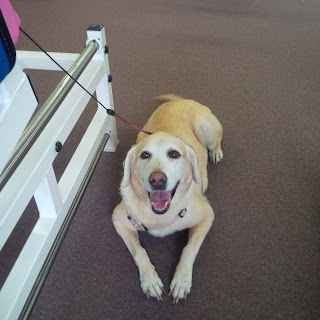 What a wonderful idea to bring Baylee with you to the gym - I am sure she appreciates the extra love and attention more than words can describe! Oh man. I am so sad for you - losing a pet is just rough. Baylee looks like she had a great time at the gym and I love that you did that for her. Hang in there - I know you'll be missing your other dog for a long time. I'm so sorry you lost a member of your family! I'm sure it has helped you and Baylee to be together a little more this week. So sorry about your Weimar... Glad you can spend extra time with Baylee. Looks like some good gym time! Oh, I am so sorry for you and for Baylee. So sad to lose a member of your family. I am so, SO sorry for your loss. Heartbroken for you. :( Baylee is beyond adorable, and I'll bet she appreciates that extra time with you! I'm so sorry to hear about your loss. Sending you positive thoughts! I'm sorry I am so behind this week on getting on the blog. But I truly am sorry for your loss. You've been in my thoughts this week! I didn't think about it when you mentioned it, but after reading this it totally makes since that Baylee would have a hard time with this too. I think it's awesome you brought her along! She is such a beautiful dog too, and obviously by her smile she is one happy dog!! !